Every time Ray and I put together our thoughts for the next Magic Dinner & Bourbon Show we keep adding more and more to the magical experience. This next special event, on Friday – March 31st, is no exception. From interactive media and brand new, mind blowing tricks (which have taken months to create and rehearse, by the way… Ugh!) to an exclusive cocktail menu created for our guests only, it seems like we will never cease to find ways to improve this production. A curious blend of spellbinding entertainment, fine food and drink is what the first restaurant manager we ever worked with decided to call our show. Each piece – the magic, the dinner and the bourbon – all stand alone as talent showcases. I get to thrill you with baffling illusions and sleight of hand artistry. The chef fills your belly with delicious foods prepared with local ingredients. And our featured bourbon is always guaranteed to satisfy you but I am particularly excited about the representative from Jim Beam that will be joining us next week. Beth Burrows, Kentucky Brand Ambassador for Jim Beam, has actually been with us for a very long. 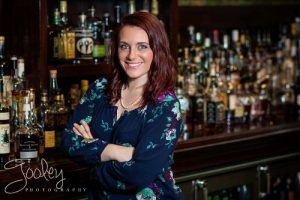 As Lead Bartender turned General Manager at Down One Bourbon Bar – where it all started for Magic, Dinner & Bourbon – Beth was behind the scenes to ensure that our enchantingly intimate dinner parties were flawless when it came to the food and beverages. She always took the best care to make service and quality the utmost priority and she exceeded expectations every time. But, just as we did when we finally outgrew the quaint Speakeasy Room at Down One, Beth answered a call to expand her reach into bourbon culture and now she is a spokesperson for Jim Beam hosting a number of whiskey related events all over the country. Without question, Beth has been my favorite mixologist. She definitely knows her spirits and knows how to enhance the flavor with other ingredients. A small part of me is sad that I can’t just drop into the bar and order up a Manhattan from her anymore but I’m proud and excited to see where she has already taken her career and where it is headed. To honor Beth and of course our new friends at Jim Beam, we asked the staff at Bristol Bar and Grille to create a unique cocktail menu for us and I just dropped by Wednesday night to see what they came up with. Hot damn was I impressed! Their mixologist, who I now know only as Mariel the Bartender, has whipped up a real dandy. In fact, that’s what they are calling it; The Jim Dandy. An incredibly refreshing mix of Jim Beam KY Straight Bourbon, Aperol, fresh basil and lemon topped with a splash of Ale 8. It was a blessing and a treat to taste this bright and tangy libation. A reminder that – though it may not feel like it – Spring is definitely here. It’s a perfect balance of sweet and tart that tickles the tongue and when you’re left staring at a glass filled only with glazed ice cubes, you are certain that another is due. You can stop in at Bristol Bar and Grille on Main Street in Louisville anytime this week or next to try the Jim Dandy for yourself. Hard to believe it’s only the top of the list. This and many more unique cocktails will be available at the next Magic Dinner & Bourbon Show on Friday, March 31st. Looking forward to seeing you there. Cheers!!! 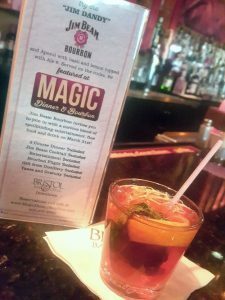 #magicdinnerbourbon, Bourbon Blog, Bristol Bar & Grille, Jim Beam, Richard Darshwood. Bookmark.